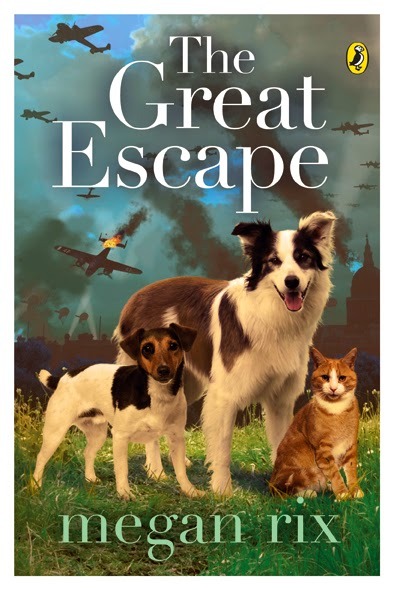 Children from Thomas Reade Primary School and Chandlings School listened as Megan described her experiences training assistance dogs, and how she used this to tell her stories of animals performing incredible feats of bravery and heroics during times of conflict. 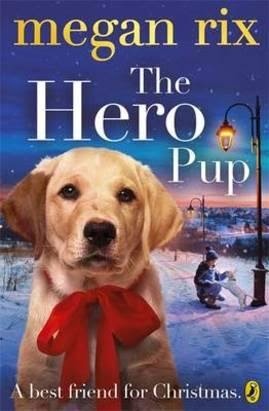 Her latest book, 'Hero Pup', tells the story of a young boy Joe and a puppy, Patch. Joe and his Dad have always wanted a dog, but when Joe's father dies, he doesn't think he will ever have one. But when Joe meets Patch at Helper Dogs, Joe has the opportunity to train Patch to make him a useful companion to someone in need. And as their relationship develops, Joe starts to overcome his feelings of gried in what is a very moving but uplifting story. The special guest was a retired guide-dog called Dru, brought to the school by her owner Richard. Part Labrador Retriever, part Golden Retriever, 12 year old Dru had actually been a breeding dog for other guide dogs, having had 25 puppies, most of which had gone on to become guide dogs. Megan explained how she came to be a writer - including her own experiences of being off school with whooping cough for a whole term. Having been at the bottom of her class and not very interested in reading, she had nothing to do but read - with her mum bringing books from the library, and her voraciously reading everything she could get her hands on in the house ((including books she probably wasn't supposed to read!). When she returned to school, she found herself at the top of the class - a great testament to the power of reading for pleasure! The children had plenty of questions about her books, but also about her own dogs - and of course Dru. I’m currently working on a World War I-era tale involving a circus dog and a young elephant – the dog attempts to reunite the young elephant with its mother. During World War I a lot of elephants were taken from zoos and circuses and ended up doing heavy lifting work around the country, and the older elephant is logging in the Lake District. I typically think and plan the book for a month before writing, but this one is taking a bit longer. Don’t stop. You must continue to write, because as you practice you cannot help but get better. Don’t instantly think that you’ll be good, and don’t limit yourself to one kind of writing, because you don’t know how your style will evolve. The best thing is the sheer variety of writing that you can do – for different ages, styles, etc. You have total freedom to set books where you like, when you like. If you write as an adult author, you tend to get stuck with a particular genre (such as crime) but you are really not as limited as that when you are a children’s author. Worst thing – I can’t really think of one! 4. Do you have a writer’s survival kit, eg a place, thing or snack essential before you can start work? Years ago, when I was writing books under my real name (Ruth Symes) I would have said yes, I would prepare to write by lighting some incence sticks, etc. But now, and particularly since I’ve owned and trained dogs, I tend to sit on my bed writing with the dogs asleep next to me. One thing I do use is a marvellous digital pen. This lets me write in longhand as if with a traditional pen, but then I plug the pen into my laptop and everything is downloaded as text without having to retype it. It sort of relates to what I mentioned earlier about writing tips – the whole ‘Megan Rix’ pseudonym came about because (initially) I wanted to write about things that had actually happened to me and my family – and to protect my privacy. But out of that came stories about animals, and I changed my style of storytelling. Up until then I had always written in quite a ‘realistic’ style, but with Megan Rix I was able to develop an ‘omnipotent viewpoint’ style. I had never had the confidence before, because at school they squashed you if you tried to use this. It was almost like “The omnipotent viewpoint? Do you consider yourself to be God?”!